As promised last fall at its Zoomtopia user conference, video collaboration provider Zoom today brought its Zoom Voice cloud phone system to market, along with other previously announced features and offerings. Following extensive beta testing with dozens of companies, Zoom Voice is now available as an add-on to the Zoom platform. It supports inbound and outbound calling through the PSTN and integrated telephony features, so enterprises desiring to consolidate their business communications assets can do so by leveraging the Zoom platform for their video, voice, messaging, and chat. Zoom Voice is currently available to U.S. and Canadian customers with more than 50 employees. It is due to roll out to other geographies and all businesses throughout 2019, Zoom said. Virtual background -- Now with no green screen required, this feature allows users to display any image as their background during a Zoom Meeting. Today, this feature is supported on Mac i7, iPhone 8, iPad Pro 5, iPad 9.7 and all later models for these devices, with support due for Windows by the end of second-quarter 2019. 1080p support -- Now available to all Zoom users with high-performance PCs, for video and screen sharing of videos. Audio signature -- Announced at Zoomtopia, this security feature adds an ultrasonic watermark to audio streams that provides a way for admins to identify the source of any leaked audio. Finally, Zoom has brought new integrations to market via its App Marketplace, which hosts integrations built by Zoom and third-party developers. 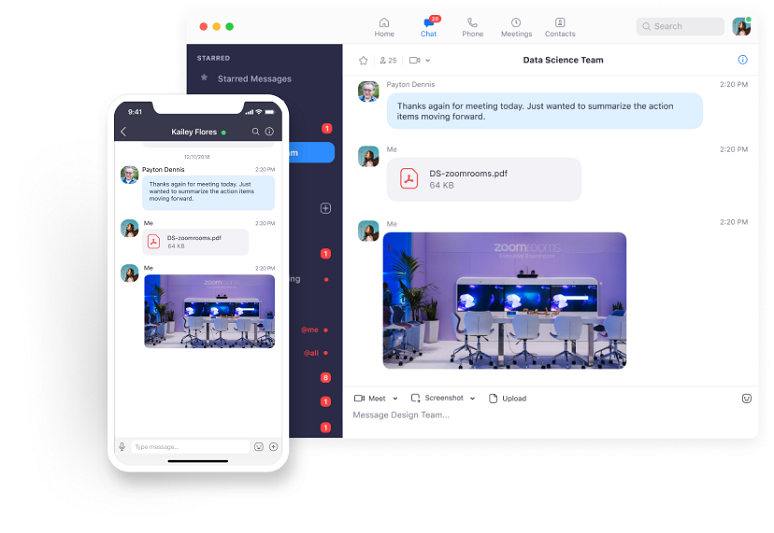 Zoom is releasing a native integration of Zoom for Hubspot, as well as integrations for LinkedIn Sales Navigator, for surfacing LinkedIn profile information inside Zoom Meetings, and Theta Lake, for compliance and archiving for Zoom video, chat, and audio. To gain access to all these new features and upgrades, customers can update their Zoom clients or contact Zoom directly. In a No Jitter briefing with Zoom executives in late 2018, Zoom credited its product portfolio evolution to its customer-first approach. The success of its approach, Zoom said, can be seen evidenced in its Net Promoter Score, which at the time of the briefing was 74. In the last two years, through close ongoing interaction with its customers, the team has brought more than 200 new features to market each year, executives said.